Below is a sample from one of our historic US coin values online reports. The reports consist of tables showing coin pricing from many years in the past to the present. All of our online reports contain a table for every coin in the group (e.g. Lincoln Cents). Information in the tables is highlighted and explained in the sample. The main idea of the Coin Value Tables is to show collectors how individual coin dates change in value over time. Some have increased in price much faster than others. Long term price trends from the past are the best indicator we have to predict what may happen in the future. Thus, coins with solid historical gains are the coins most likely to do the same in the years ahead. All the Coin Value Tables on this website closely resemble the sample below. There is no charge to view the data. These are FREE coin reports. 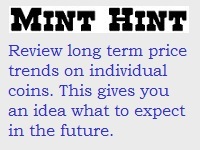 We want you to use this information to select coins with the best chance of rising in price, if that is your goal. We also provide PDF downloads with the exact same information, reformatted for easy printing. The Collector Index, not seen in the sample below, is a bonus feature offered exclusively in the printed reports. Read more about the Collector Index and get printed reports in easy-to-use PDF format over at the US Coin Reports Print Center. A more thorough explanation on Coin Value Table research, grading concerns, and underlying philosophy is presented a few paragraphs down. Year: This column indicates the year for which the values in each row correspond to. Grade: This row indicates coin grade, based on the ANA scale. Example: VG-8 stands for Very Good-8. Value: The examples circled indicates this coin was worth $5775 in XF-40 condition in the year 2011, but fell to $5300 by 2015. 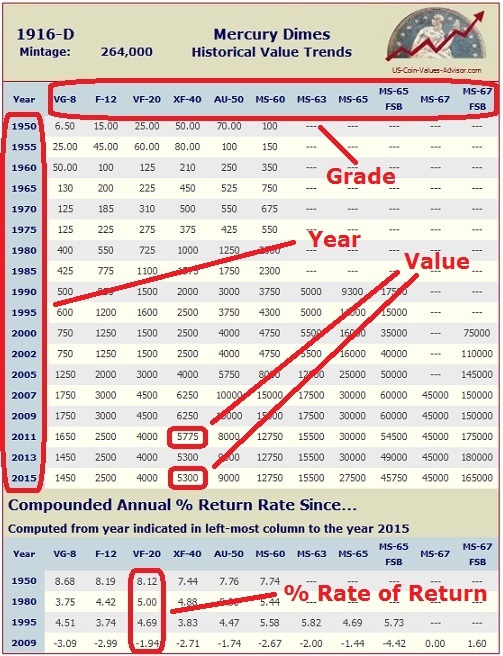 Return Rate %: Show the effective percentage annual return rate, from the year in the far left column to the present. The example circled indicates this coin in VF-20 condition advanced at a rate of 8.12% annually from 1950 to 2015. The same coin grew at an annual rate of 5.00% from 1980 to 2015, and 4.69 a year from 1995 to 2015. However, it lost 1.94 percent annually from 2009 to 2015. Occasionally, we get questions on the "How, What, and Why" regarding the Coin Value Tables. The following bullet point links explain in greater detail the inner workings of the tables. How were the Coin Value Tables Researched? The primary purpose of the Coin Value Tables is to provide coin buyers with historic value trends over the last half century for individual coins, in order to identify coins possessing the best opportunity for solid future growth, while avoiding those with questionable potential. This is not to say that rare coins should be viewed strictly as investment vehicles, but if you enjoy numismatics and intend to make some purchases, why not make selections destined to rise in value over time? By reviewing value trend data covering a period of many years, one can determine proven "track records" and make smart purchase decisions. Look for coins with the most impressive growth rates over long periods of time. These are the coins that will command the highest prices from the coin collecting hobby in the years to come. Hindsight is the clearest form of vision, and it is the most powerful tool available. Some examples on how to use the Coin Value Tables for locating blue chip coins are found on our Bullish US Coins page, which spotlights a few of the obvious winners. Coins with extraordinary potential, identified as key dates, are also mentioned on most pages in our U.S. Coin Types section. Compounded annual rate of return is a universal measure of investment return. The Coin Value Tables contain many compounded annual return rate computations, to facilitate comparisons from one coin to the next, measuring how much they change in value over time. Compounded annual return rates, the typical yardstick for measuring investment vehicles, are offered here and are from 1950 to the present, 1980, 1995-2000, and 2009-2010, all to the present year. 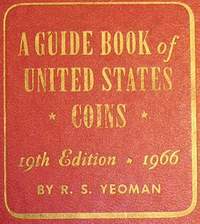 As the popularity of coin collecting expanded in the 1950s, the Whitman coin folder was the faithful companion of the budding numismatist. 1950: More than five decades ago, most of even the rarest collectible coins had not yet started their ascent into the pricing stratosphere (after all, who today could imagine purchasing an 1893-S Morgan silver dollar in VG for a mere $15.00?). Not coincidentally, this is just about the time coin collecting started gaining appreciably in popularity in the United States. Thus, evaluating annual growth since 1950 is a worthwhile endeavor because it is a reasonable "starting point". What you will see is that coins held in the highest esteem by collectors (i.e. "key dates") have easily outpaced their more mundane brethren over the last half century, and will continue do do so. By comparing compounded annual return rates since 1950, the most important coins sought by numismatists are readily identified. 1980: The precious metals boom of 1979-1980 simultaneously fueled a massive explosion in coin prices. By the winter of 1980 the coin industry stood on an unprecedented plateau. Since then, coin values have gone down and up tremendously several times. Any coin weathering the wild roller coaster ride since 1980 is certainly a fine acquisition. **In 2014, gold hovers around $1200-$1400/oz, but when inflation is factored in, the 1980 high is still by far the record close. 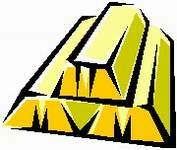 1995-2000: In 1995-2000, coins were emerging from the shadows of a severe slump that had spanned several years. Many observers cite as the cause of the tailspin the issuance of the grading services initial population reports in the late 1980s, which provided a better glimpse of the actual scarcity of collectible coins, followed by speculators fleeing from coins. Since 1995, we've witnessed a steady, if not spectacular, rise in numismatic market conditions. With the speculator debacle behind us, you can bet the price hikes since then are supported by sound fundamentals. Coins that have appreciated nicely since 1995 are likely valuable heirlooms you will be proud to pass on to your grandchildren. 2009-2010 We include rate of return computations from the more recent past. The global economic downturn that began in late 2008 has not, as a whole, dramatically suppressed coin market activity. To the contrary, prices have held steady or have risen. That's not to say some coins have not suffered a pullback in pricing, because here and there we've seen some values reductions since 2009-2010. The Rare Coin Value Index trends show the market holding its own during recent tough economic times. Perhaps you prefer a different year for a baseline comparison. Whatever time frame you choose, you're in luck here, because this site features a flexible Coin Rate of Return Calculator, where readers are free to compute compounded annual return rates for virtually any time period, for any coin they wish to analyze. It's easy and fun to use, and yields great information! Grading has always been central to numismatics, but decades ago, the standards employed to grade coins were somewhat vague and applied inconsistently. Over the last 20 years, great strides have been made to bring more standardization to grading practices. Throughout it all, the magnifying lens has earned a reputation as one of the most important tools the coin collector should invest in. Going back to the 1950s and before, coin grading was limited to a few adjectival terms, such as Good, Fine, Uncirculated, and Proof. Accordingly, numismatic references of those times conformed to the same set of adjectives to approximate retail coin values. Varying distinctions of Uncirculated (today's equivalent of MS-60, MS-63, etc.) and Proof were recognized in some advertisements and auction bills by employing modifying descriptors such as "Gem Uncirculated" or "Choice Proof", for example. However, with no clear point of reference or consistency on how the modifying descriptors were invoked, most publishers resorted to listing values for only one "Uncirculated" grade and one "Proof" grade. In the late 1970s, as coin prices escalated dramatically, most notably for pristine, high quality specimens, varying distinctions of "Uncirculated" and "Proof" became evermore critical. Descriptors "Choice" and "Gem" were replaced by numerically assigned grades, utilizing the newly developed 70 point ANA scale, based on a numeric system introduced by Dr. William Sheldon in the 1940s. Uncirculated coins were differentiated as MS-60, MS-65, or MS-70. A few years later, grades MS-63 and MS-67 joined the fray. 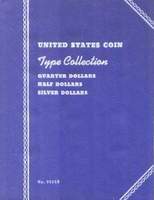 Although not applied consistently (a situation that gave the coin business a black eye), the practice of assigning a numerical grade to indicate quality was universal by the mid-1980s, and eventually brought some consistency to coin collecting that was absent as the hobby passed through its formative years. The Coin Value Tables reflect the historic availability of numeric grades to describe coins. Thus, for 1950 through 1975, the values appearing in the MS-60 column should be viewed as the "Uncirculated" listings of those years, since numeric grades largely did not exist. Likewise, PF-65 corresponds to simple "Proof" figures of the same time period, while G-4 corresponds to the "Good", VG-8 to "Very Good", and so forth. By 1980, when numeric grades were in widespread use, the MS-60 column should be interpreted to indicate precisely that. Other grades, MS-63 for example, made their debut on the Coin Value Tables in 1980 or later, and are carried forward from that time to the present. As more intermittent grades and qualifiers (e.g. "Dimpled" Morgan silver dollars) became commonplace, they too were added to the Coin Value Tables. One Caveat: In February 1986, the ANA changed its grading interpretations to match the tightening standards demanded by the marketplace. This meant that many coins correctly graded as MS-65 in the early 1980s became MS-63 or less, so as to be consistent with the newly revised interpretation. Conversely, a coin graded after 1986 as MS-63 was about equal in quality to an MS-65 before 1986. Thus, the Mint State prices published in numismatic periodicals prior to 1986 are not directly comparable to those published later. The Coin Value Tables of this website relied heavily on periodicals from before 1986, but we did not attempt to compensate for the revised grading standards of 1986; we reported what we found. One must take this into account when studying trends for an MS-65 coin from, say, 1980 to the present. On the other hand, because of the dearth of Mint State price estimates published prior to 1986, more than 98% of the Coin Value Table data is not affected by anything mentioned in this paragraph! More in-depth knowledge on grading is presented on our Grading Coins section. 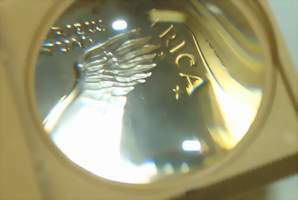 There, you'll find a few thoughts on the importance of coin grading, a look at the ANA grading scale, plus more. How Was the Coin Value Tables Data Researched? The "Redbook" was one of many sources researched for trends. In its earlier years, the popular reference was somewhat sketchy by today's standards, as were all coin publications of those times. Many of the old coin values reported in the tables were researched from the vast holdings of the ANA library (American Numismatic Association). Reference materials include vintage advertisements, auction results, and a wide variety of numismatic periodicals and other publications from decades ago. Coin values of recent years were researched through much the same method, utilizing, of course, newer material. Data collection efforts for coin values of modern times were greatly augmented by Internet availability. In all cases, the prices appearing in the Coin Value Tables represent a compilation of data from these sources, in order to provide to our readers the most accurate historical coin value trends possible.